Alycia “AJ” Johnson is the Campus President of the Stratford University, Alexandria, VA campus. Ms. Johnson is currently a Doctoral Candidate in the Higher Education Administration program at The George Washington University. In her Campus President role, she serves as the chief administrative officer with full responsibility for all human, financial, and physical resources at Stratford’s Alexandria campus. Additionally, she is responsible for all of the academic functions of the campus. 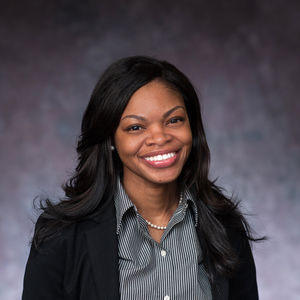 Ms. Johnson most recently served as the Director of Enrollment Management and Director of Recruitment & Admissions at The American University in Washington, DC. She has also held several other higher education positions including Executive Director for Admissions at Trinity Washington University and Admissions Manager at 2U, Inc. Prior to her start in higher education she worked in Human Resources as a Diversity Specialist at Fortune 500 company, EMC Corporation, and has worked in Human Resources at the state-funded Massachusetts Technology Collaborative. Ms. Johnson earned her Masters of Arts in Communication Studies at the University of Miami in Coral Gables, FL, as well as a Bachelors of Arts in Communication Studies from Northeastern University in Boston, MA.